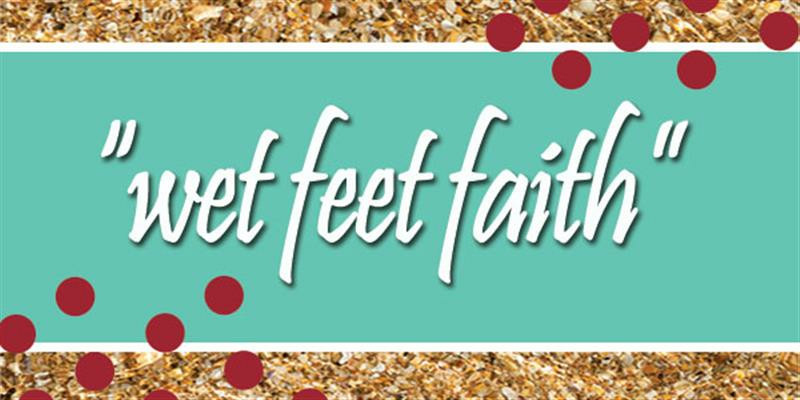 Wet Feet Faith is our CCM Viera Women’s Ministry summer series. Wet Feet Faith focuses primarily on the book of Joshua and the Israelites’ faith as they had to put their feet in the river BEFORE God separated the waters: hence the name, Wet Feet Faith. We believe we should take time during each summer to focus on our own personal faith. Wet Feet Faith is intended for all women of all ages and life stages. During our summer study, all of our typical groups and classes cease so that we can all come together to worship, study and share together as one body. We will be learning how to put feet to our faith by stepping out where God calls us to, especially as it relates to the topic of standing firm in our faith. We will be focusing each week on different facets of spiritual firmness: what does it look like? How do we do we walk it out? How can we possibly remain spiritually firm in difficult circumstance? And what that all means in our daily walk with the Lord. During Wet Feet Faith we will worship together, hear the weekly teaching, and break into discussion groups during our study time. This year, immediately after the study, we will be offering café lunch specials so you can continue the conversation among like-minded women. Got a busy summer and can’t make every Thursday? No problem. Each session is independent, so participate at any time. And you are always welcome to bring more women with you. Childcare is free, but you must sign up in advance as we will fill up. Childcare registration information will be emailed to you shortly after you register. Joshua 3:8 - "When you reach the edge of the Jordan's waters, GO and stand in the river." For questions, please contact Angela.